Preventive dentistry can help you achieve optimal oral health and minimize potential dental complications like oral decay and gum disease. At our Manhattan and Brooklyn offices in NYC, Dr. Maurice Benjamin offers a full scope of preventive options including routine cleanings, exams, and fluoride treatments to promote and sustain oral health. In addition, it is important to practice proper oral hygiene at home. 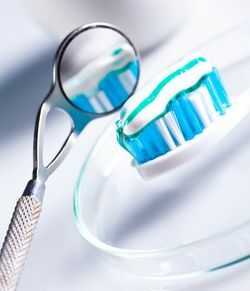 Brushing, flossing, and using mouthwash regularly can prove invaluable for the health and aesthetics of your smile. At least twice per year, you should visit our office for a professional teeth cleaning. During this procedure, one of our highly qualified and friendly hygienists will use specialized instruments to clean your teeth. Despite regular brushing and flossing at home, you will not be able to remove all harmful bacteria yourself. By gently removing plaque and tartar from the tooth surface and gum line, our team can protect your long-term oral health. To add the finishing touches, your hygienist will polish your teeth for a smoother and brighter appearance. During your regular appointments Dr. Benjamin will examine your teeth and check for any changes in your overall oral health. He can spot any developing decay or serious complications in the earliest stages and recommend appropriate, effective treatment options. The earlier you undergo restorative care, the less discomfort and expense you may face. In order to recommend the best treatment plan for you, Dr. Benjamin may request x-rays to evaluate your teeth and jawbone. If your treatment requires dental impressions, our office uses the revolutionary Cadent iTero® technology for optimal comfort. This fully digital system eliminates discomfort associated with traditional impressions. You can prevent a majority of dental complications by maintaining good oral hygiene practices at home. Brushing, flossing, using mouthwash, and living a healthy lifestyle can help to reduce dental sensitivity and your risk of disease. During your routine visits, Dr. Benjamin and our hygienists can help you to develop an effective brushing technique to remove plaque and debris from the teeth and gum line. In addition, we can demonstrate the proper way to floss, which effectively cleans areas that brushing simply cannot reach. Dr. Benjamin may also recommend an appropriate mouthwash as a final line of defense against bacteria and germs. To help you achieve an aesthetic, healthy smile, Dr. Benjamin and our team can provide the vital preventive care you need. Dr. Benjamin is dedicated to helping patients achieve the best oral health. Decay and oral concerns such as gum disease can have long-lasting and far-reaching effects. Gum disease alone has been linked to a number of serious conditions, including heart disease, diabetes, stroke, respiratory issues, and dementia. Proper at-home care and regular visits to our office can help you to preserve your oral and overall health. To help you achieve an aesthetic, healthy smile, Dr. Benjamin and our team can provide the vital preventive care you need. If you are ready to take action to preserve your oral health, call our practice today at (212) 252-8893 or fill out our online form.